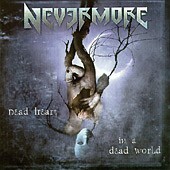 I don't think I would be overstating myself to say that with "Dead Heart In A Dead World" NEVERMORE continue to establish themselves as one of, in not THE, premiere classic metal band on the planet. There are only a handful of bands playing this style of "power over progressive" metal who have been around as long as NEVERMORE (especially if you count their years as SANCTUARY, which I inevitably do) and almost none who have maintained such a high caliber of delivery album after album. This disc has all the classic and trademark vibes you would expect from NEVERMORE plus it shows the band fleshing out there sound with more expansive use of melody and texture. Admittedly this album lacks a lot of the harshness of previous NEVERMORE recordings which I think is a result of having trimmed down to a four piece while still expanding their range. A superb album to say the least.